Add a piece of Oregon State Parks to your tree this holiday season. 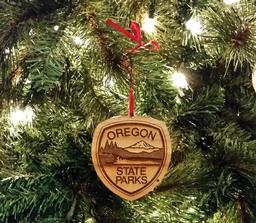 This ornament is made from Black Cherry wood grown and milled in the USA. The ornament is finished with a non-toxic food-safe oil to enhance and protect the natural beauty of the wood. Ornament comes tied with a hanging ribbon and bow (also made in the USA).